Fletcher Strong ’04 and Karen Foster, July 2. Click to read a Colgate love story. Gaston E Blom ’41, April 20, 2016. Phi Beta Kappa, Commons Club. US Naval Reserve. Harvard Medical School: MD, 1944. During his life, he was a training psychoanalyst at the Institute for Psychoanalysis in Chicago and the Denver Psychiatric Institute; the founder of a day treatment program for emotionally disturbed children at the University of Colorado Medical School; and a professor of psychiatry, special education, and psychology at Michigan State University. In 1985 he moved to Boston, where he was a practicing psychologist until the age of 88. He is survived by his wife, Dorothy; 4 children; 10 grandchildren, including Ben ’06; and 6 great-grandchildren. Charles C McDonald ’41, January 28, 2016. US Navy: WWII. University of Detroit: DDS, 1944. He practiced dentistry in Gross Pointe Woods, AZ, for 45 years. He was predeceased by his first wife, Betty. He is survived by his second wife, Susan; 2 children; 2 stepchildren; 7 grandchildren; and 9 great-grandchildren. Edward T Dunn ’42, April 22, 2016. Sigma Chi, football, basketball. US Army Air Corps. Springfield College: MA, 1950. For 50 years he worked at Springfield College as a football coach and physical education professor. He was named New England Coach of the Year in 1965, and was National Chairman of the College Division All-American Football Team selection for 5 years. He was predeceased by his wife, Ann. He is survived by a daughter, a grandson, and 3 great-grandchildren. William B Wheatley ’42, June 21, 2016. Phi Kappa Psi, swimming, tennis. Ohio State University: PhD, 1947. During WWII, he helped develop pesticides for the war in the Pacific. In 1947, he began his 35-year career in pharmaceutical research at Bristol Laboratories in Syracuse, developing antibiotics and publishing more than 30 research papers. After retirement, he taught chemistry at Onondaga Community College and Le Moyne College. He was predeceased by his daughter, Elizabeth. He is survived by his wife, Martha; 4 children; 5 grandchildren; and 3 great-grandchildren. Donald J Byrne ’43, September 18, 2013. Phi Kappa Psi. US Army Air Corp: WWII. He spent his career with Amoco. He is survived by his wife, Charlotte, and 2 children. Richard G Dytman ’45, May 13, 2016. Theta Chi, debate society. US Army. University of Pennsylvania: MBA, 1959. He worked for many years as a public accountant in Elmira, NY. He is survived by a brother, as well as 7 nieces and nephews. Grant E Nelson ’45, March 24, 2016. Sigma Nu, soccer. US Navy. In the Navy, he became the commanding officer of the USS Strength, a minesweeper in WWII. He later became president of Perrigo, Inc, from which he retired. He was predeceased by his wife, Joyce. He is survived by a daughter, 2 grandchildren, and 4 great-grandchildren. John D Powers ’46, March 19, 2016. Phi Delta Theta, swimming. US Navy: WWII. Temple University: MD, 1951. He was a member of the American Academy of Family Physicians and conducted his medical practice for 50 years. Upon retirement, he became medical director of the Riverview Medical Center Outpatient Clinic. He was predeceased by his wife, Eleanor. He is survived by 6 children and 13 grandchildren. Paul E Reeves ’46, March 8, 2016. Phi Beta Kappa, University Chorus, marching band. US Army. University of Rochester: MD, 1949. In 1955 he established his own medical practice where he worked until 1978, when he accepted a position as staff physician at St John’s Home in Rochester. He was predeceased by his son. He is survived by his wife, Beverley; and 3 daughters, including Anne Haake ’79. Herbert A Knapp ’47, June 13, 2016. International Relations Club. US Army: WWII. New York University School of Medicine. In 1952 he worked as a special investigator for the Monmouth County Medical Examiner’s office. Later, he served as assistant medical examiner before opening his own private practice. He was predeceased by a daughter. He is survived by his wife, Faith, and 2 daughters. John J Kovaric ’47, January 8, 2016. US Army Medical Corps: 1948–1970; bronze star and legion of merit. Albany Medical College: MD, 1950. He was a general surgeon from 1970 to 2005. He is survived by his wife, Ruth, and 4 children. Richard B Letts ’47, March 31, 2016. Alpha Tau Omega. He worked alongside his father and brother, running several family owned gas stations, before moving on to form LF Letts & Sons, from which he retired after 50 years. He was predeceased by his wife, Barbara, and a daughter. He is survived by a son, 3 granddaughters, and 4 great-grandchildren. Bertram L Conn ’48, March 30, 2016. Lacrosse, soccer. He was co-owner and executive of Kansas Packing Company, a national distributor to freighters, cruise, and container ships. He is survived by his wife, Arline; 6 children, including Susan ’79; and 15 grandchildren, including Alex Wrobel ’15. George C Godfrey II ’48, May 4, 2016. Phi Kappa Tau, Salmagundi, cross country, indoor track. US Army. Thomas Jefferson Medical College: MD, 1952. He taught general surgery as an adjunct professor for more than 25 years, and served on the staff at Shore Memorial Hospital for more than 50 years. He was predeceased by his wife, Evelyn. He is survived by 2 children, including Chip ’87. Charles B Guernsey ’48, June 11, 2016. Kappa Delta Rho, Masque and Triangle, swimming. US Navy: WWII. During his long career, he worked in sales for the Boroughs Corp, Dun & Bradstreet, and Commerce Clearing House before becoming director of community development for the township of Radnor, PA. He was predeceased by 2 sons. He is survived by his wife, Patricia; a daughter; 2 stepsons; 5 grandchildren; and 4 great-grandchildren. Richard J Lyman ’49, February 9, 2016. Phi Kappa Tau, International Relations Council. US Navy: WWII. In 1989 he retired as president of Fiberesin Industries. He is survived by his wife, Lora; 7 children; 22 grandchildren; and 17 great-grandchildren. Harold B Simpson Jr ’49, March 2, 2016. Sigma Nu. US Navy: WWII. He worked for the advertising firm William Etsy & Company for 41 years, retiring as senior vice president of human resources. He is survived by his wife, Nancy; 4 children, including Doug ’81; and 9 grandchildren, including Lindsey ’10. Albert E Sproul Jr ’49, May 10, 2016. Beta Theta Pi. US Navy: WWII. He was CEO of the family insurance business Donnelly & Sproul in Hackensack, NJ. He also served as a trustee and deacon at the Tenafly Presbyterian Church. He was predeceased by his wife, Charlotte. He is survived by his daughter, Janet Robinson ’77; and 2 grandchildren, including Sam Robinson ’12. Spencer D Ferris ’50, March 16, 2016. Delta Upsilon. US Navy: WWII. 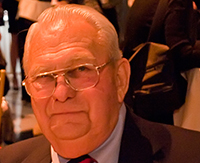 In 1950, he co-founded the Swarthout & Ferris Bus Company, from which he retired in 1988. He was predeceased by his first wife, Margaret. He is survived by his second wife, Fern; 4 children; and 7 grandchildren. Frederick J Flatley ’50, June 6, 2016. University Chorus, golf, student government. University of Rochester: MD, 1954. As a clinical professor of medicine at the University of Rochester Medical Center, he practiced internal medicine for 36 years. He is survived by his wife, Mary; 3 daughters; and 6 grandchildren. Paul M Ford ’50, June 9, 2016. Sigma Nu, Maroon, Outing Club, basketball. US Air Force: Korean War, Vietnam War. He earned the Air Medal, the Meritorious Service Medal, the UN Medal, and the Korean Conflict Medal with two battle stars for his 32 years of military service. He also succeeded his father in business as the owner and chairman of Prudential Paul Ford Realtors of Easton, retiring in 1997 after 42 years. He is survived by his wife, Nancy; 3 daughters, including Carol Asiello ’78; and 7 grandchildren, including Alyson Asiello ’09. James F McMahon ’50, May 26, 2016. Theta Chi, International Relations Council, football. US Coast Guard. Following the service, he joined Univac Remington Rand as a salesman. He was predeceased by a brother, Edward ’46. 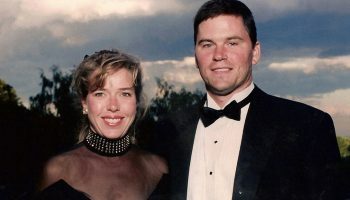 He is survived by his wife, Barbara; 2 children, including Jay ’84; 2 grandchildren, including Thomas Cramer ’06; and several nieces and nephews, including Molly Maguire ’76, Edward McMahon Jr ’70, and Bruce Ballard ’79. William N Miller ’50, March 30, 2016. Beta Theta Pi, Outing Club, Ski Club. US Army: WWII. After a stint as chief labor relations negotiator at Alcoa Aluminum, he was hired by the CIA to recruit, assess, and train both US and foreign personnel on intelligence-gathering techniques. He was awarded the US Intelligence Medal of Merit for his efforts in POW work. He was predeceased by his wife, Nancy, and a son. He is survived by a son. James A Tsigounis ’50, June 20, 2016. US Army. University of Pennsylvania: DDS. He maintained successful dental practices in Jersey City and North Bergen, and in 1970, he was ordained a Greek Orthodox priest at St Demetrios parish. He also served as assistant professor at the University of Medicine and Dentistry of New Jersey (now Rutgers). He is survived by his wife, Presbyteria, and 2 daughters. Donald E Freud ’51, June 28, 2016. Alpha Tau Omega, Salmagundi, ROTC. US Marine Corps. US Air Force. University of Pennsylvania: MBA, 1955. In 1955, he joined IBM where he served in many marketing and management positions for 37 years. He is survived by his wife, Justine; 3 children; and 4 grandchildren. James EH Merwarth ’51, May 31, 2016. Alpha Tau Omega, lacrosse. US Marine Corps Reserve. Beginning in 1967, he worked as a US special agent, GS-13. He was predeceased by his wife, Evelyn. He is survived by 2 daughters. Richard W Stowe ’51, July 3, 2016. University Chorus. He retired from the Eastman Kodak Co in 1985 as the program manager in the government systems division. He is survived by his wife, Alma; 2 children; 2 grandchildren; and 2 great-grandchildren. Paul R Vansant ’51, June 3, 2016. Phi Kappa Tau, pep band, indoor track. US Air Force. After his military discharge in 1955, he began his career as an insurance adjuster, working at agencies in Buffalo, Chicago, Boston, and Philadelphia. He was predeceased by his wife, Marian, and his youngest son. He is survived by 4 children, 3 stepchildren, 4 grandchildren, and 3 great-grandchildren. George B Cowper ’52, May 25, 2016. Delta Kappa Epsilon, University Chorus, Psychology Club. US Marine Corps. He started his successful 35-year business career with IBM in Buffalo, NY, before moving the family to Wilton, CT, where he became manager of industry relations. He was predeceased by his wife, Lynn, and his brother, William ’43. He is survived by 5 children, as well as 5 granddaughters and 5 grandsons. John F Hartley ’52, April 7, 2016. Theta Chi, University Chorus, lacrosse. Middlebury College: MA, 1953. US Army. Prior to 3 years of Army service, he taught French at the Choate School in Connecticut. Then, after 19 years with Travelers Insurance Company, he joined the Charter Oak Insurance Agency and eventually became an owner. He is survived by his wife, Kathleen, and 2 sons. Royal F Potter Jr ’52, April 5, 2016. Sigma Chi, International Relations Council. He worked at numerous publishing companies, eventually lending his skills to Reader’s Digest. After an early retirement in 1986, he became the owner of RFP Direct and publisher and owner of Pinto Press. He is survived by his wife, Joan, and 4 children. Charles K Zoller ’52, June 30, 2016. Lambda Chi Alpha. US Navy. In 1957, he joined Northwestern Mutual Life Insurance Company as an agent, remaining with the company as a chartered life underwriter until 2014. He was predeceased by his wife, Marilynn. He is survived by 4 children, 12 grandchildren, and a great-granddaughter. Clarke Russ ’54, March 16, 2016. Phi Kappa Tau, Masque and Triangle, Outing Club, sailing. Albany Medical College: MD, 1959. Army Medical Corps. He practiced orthopedic surgery in Norfolk and Virginia Beach for 30 years. He is survived by his wife, Rinda, and 4 children. Donald M Rebar ’55, June 3, 2016. Delta Kappa Epsilon. He owned and operated Hy-Level Industries until his retirement in 2007. He is survived by his former wife, Constance; 2 children; and 4 grandchildren. John S MacDaniels ’56, May 4, 2016. Theta Chi, baseball. He turned down contracts with both the New York Yankees and the Pittsburgh Pirates in order to embark on a 30-year career in advertising. In 1988, he started his own firm, MacDaniels, Henry, & Sproul. He is survived by his wife, Joan, and a daughter. Douglas R Hoadley ’57, March 21, 2016. Phi Gamma Delta, ROTC, Masque and Triangle, Outing Club, football, lacrosse. US Air Force: Vietnam. Troy State University: MA, 1974. He had a 21-year career in the Air Force, serving as navigator, pilot, and radio intelligence operator. He ended his military career as chief of staff for the College Commandant at Maxwell AFB. Following his military service, he went to work with the Alabama Power Company and established his own pecan and blueberry farm. He is survived by his wife, Patricia; 3 children; and grandchildren. 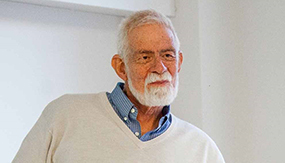 Robert L Janzen ’57, April 29, 2016. Sigma Nu, ROTC, student government, swimming, sailing, basketball. US Air Force: Vietnam. Webster College: MA, 1977. He served his country for 28 years, and was awarded numerous commendations, including the Bronze Star, the Legion of Merit, and the Meritorious Medal. Following his retirement as a colonel, he worked for the American Fire Corporation and was a member of the Spotsylvania Volunteer Fire Department for 27 years. He was predeceased by his first wife, Norma, and a son. He is survived by his second wife, Jennifer; 2 stepsons; and 7 grandchildren. Lewis A Hurwitz ’58, June 16, 2016. Phi Kappa Psi, Maroon, basketball, lacrosse, ski club. Boston University Law School: 1961. He was a senior partner in the Milford law firm of Hurwitz, Sagarin, Slossberg, and Knuff. He was a member of the Connecticut and American Bar Associations, serving on the State Bar Judiciary Committee and the State Bar Grievance Committee. In 2007, his family established Colgate’s Dale and Lewis A Hurwitz scholarship. He is survived by his wife, Dale; 3 children, including Dan ’86 and Jodie Consiglio ’91; 3 grandchildren; and several nieces and nephews, including Bruce Loshin ’82, Gregg Loshin ’83, and Caroline ’17. James L D’Eramo ’59, November 19, 2015. Delta Upsilon, Newman Club, football. Kent State University: MEd, 1965. He spent more than 30 years as an educator, working at Austintown School District in Youngstown, Ohio, as an English teacher, department chair, and president of Austintown Education Association. He is survived by his wife, Rose. James A Hoke ’59, April 8, 2016. Lambda Chi Alpha, football. He taught math at Holland Patent High School in New York from 1959 to 1991. For 15 years, he and his wife owned and operated their family business, Barneytown Mini Golf and Treasure House. He is survived by his wife, Mary; 5 children; and his grandchildren. Harold C Snowdon Jr ’59, July 12, 2016. Sigma Nu, Maroon, concert orchestra, sailing club, student government. American Academy of Funeral Service: 1960. He was a licensed funeral director and president of Harold C Snowdon Funeral Home for more than 50 years, as well as the owner of the Beer Store in Wilkes-Barre, PA. He was predeceased by his wife, Patricia, and his son. He is survived by a daughter and 2 grandchildren. David L Croft ’60, May 26, 2016. Kappa Delta Rho, Salmagundi, student government, baseball. He worked with Andersen Windows in Buffalo, NY, and Bayport, MN, for 36 years. He is survived by his wife, Mary, a son, and a granddaughter. Robert L Northrop ’60, April 3, 2016. Lambda Chi Alpha, sailing club, swimming. US Navy. In 1974, he began working in financial aid at Cornell University. He then joined St Lawrence University as the university’s director of financial aid and became the head men’s and women’s swimming coach. He was the 1999 UCAA Men’s Swim Coach of the Year, and, after his retirement in 2000, he was inducted into the SLU Hall of Fame in 2010. He is survived by his wife, Susan; 4 sons, including Timothy ’91; and 6 grandchildren. Harold Jackson Jr ’61, February 14, 2016. Phi Kappa Tau, football, basketball. Marquette University: JD, 1967. In 1970, he became the first black president of the Milwaukee School Board. He later went on to become the second black judge in the state, resigning from the judiciary in 1985 to become senior staff attorney at the Milwaukee Metropolitan Sewerage District. He is survived by his wife, Kathleen, and 4 children. Edwin B Kerin ’61, June 2, 2016. Delta Kappa Epsilon. US Army. Columbia University: MBA. A 50-year resident of Poughkeepsie, NY, he worked for and later co-owned Chemprene Inc, a rubber products supplier. He is survived by his wife, Theresa; 4 children; and 5 grandchildren. Leonard D Griffiths Jr ’62, March 28, 2016. Alpha Tau Omega. He worked in finance for many years, serving as assistant manager at the Marine Midland Trust Co and regional manager at Abiliti Price Sales Corp. He is survived by his wife, Celie, and 3 children. John C Clay ’63, July 6, 2016. Sigma Chi, International Relations Council, University Chorus. In 1964, he joined the information systems division of Procter and Gamble in Cincinnati, a position that took him to Greece and Spain. After returning, he managed the Latin American and Asia Pacific areas of information systems until retirement. He is survived by his wife, Barbara; 2 children; and 3 grandchildren. Robert E Grinnell ’66, February 29, 2016. Syracuse University: PhD, 1983. He enjoyed a long career as an administrator in higher education, serving as assistant to the president at Herkimer County College; director of development and college relations at Cazenovia College; and VP of Western New England College. He is survived by 2 daughters. Allen T Pearson II ’66, June 6, 2016. Beta Theta Pi, Konosioni, Phi Beta Kappa, Salmagundi, student government. Cornell University: PhD, 1971. He was a lifelong educator, serving as professor of philosophy of education at the University of Alberta for 25 years, then as dean of education at the University of Western Ontario until 2007. He continued as a faculty member until his retirement in 2010, after which he was appointed professor emeritus. He is survived by his brother. Joseph T Rowbottom III ’66, May 20, 2016. Phi Kappa Tau, WRCU, student government, lacrosse. US Navy: Vietnam. University of Pennsylvania: DMD, 1970. He worked as an oral surgeon from 1976 until his retirement in 2008. He was a member of the Oneida (NY) Healthcare Center’s medical staff and a past president of Oneida United Way. He is survived by his wife, Rebecca; 2 children, including Jenny Lobdell ’93; 4 grandchildren; and his brother, Jon ’68. Frank P Wood III ’67, March 28, 2015. Theta Chi, Newman Club. Canisius College: MS, 1975. He taught history and social studies for many years at the Pioneer School District in New York. He was predeceased by his wife, Diane. He is survived by 3 children and 8 grandchildren. John-Michael Battaglia ’68, June 4, 2016. Phi Gamma Delta, Salmagundi, Maroon, baseball. Syracuse University: MS, MFA, 1976. From 1968 to 1972, he worked in the Peace Corps in tuberculosis prevention, producing short films on health and literacy for the National Film Department of Malaysia. 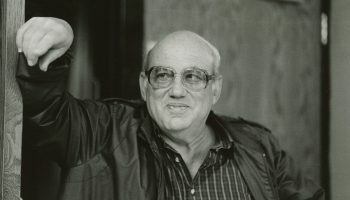 Later, he worked in Buffalo and San Francisco as a film producer, script writer, and technical writer. He is survived by a sister and a brother. David L Klawon ’68, May 30, 2016. Phi Beta Kappa, football. University of Rochester: MD, 1972. He was a partner for 28 years with Pathology Associates of Erie, and was laboratory director at Hamot Medical Center, St Vincent’s Health Center, and Corry and Kane Pennsylvania hospitals. He is survived by his wife, Sandra; 3 daughters, including Emily Newes ’00; and 7 grandchildren. Paul W Ratzlaff ’68, February 28, 2016. He served as minister at the Morristown Unitarian Fellowship from 1981 until his retirement in 2012. He is survived by his wife, Barbara; 2 children; and a granddaughter. Frederic Soll ’68, April 22, 2016. Theta Chi. Northwestern University: MS, 1970. A reporter for the Chicago Tribune and the Chicago Sun-Times, he covered wars, trials, local and world conflicts, and celebrity news. He was also co-editor and writer for Chicagoland Monthly and the Chicago Times. He is survived by his wife, Pamela. Robert C Willis ’69, April 5, 2016. Outing Club, basketball, sailing. He enjoyed a long career as a restaurateur, serving as manager of Maxwell’s Plum and Tavern on the Green in New York City, and owner of the Willis Group, a distributor of prepared foods. He is survived by his wife, Linda, and 2 children. John A Barton ’74, June 25, 2016. Kappa Delta Rho, Outing Club. A financial consultant and president of Barton Associates, he was active in local politics and produced a local community access TV program called Middletown Forum. He is survived by his wife, Cindy, and 2 sons. David W Short ’75, May 12, 2016. Alpha Tau Omega, jazz band. After graduation, he pursued a career as a drummer and music producer, moving to New York City, where he owned his own trucking company. In 2013, he moved to Madison, CT, where he owned a coffee shop and continued his love of music by teaching the drums. He is survived by 3 sisters. Douglas O Kloppenburg ’79, June 26, 2016. Delta Kappa Epsilon, soccer. DePaul University: MBA. He served as senior vice president at Hawthorn, PNC Family Wealth in Philadelphia. He is survived by his brother, Robert ’77; his wife, Krista; and 2 daughters. Arthur E Bryan ’82, April 14, 2016. Kappa Delta Rho, Konosioni, student government, rugby. He was the owner of the legendary Redhead Piano Bar in Chicago for 23 years. In 2015 he received the River North Business Association’s Community Impact Award. He is survived by his wife, Mirvat Talaat, and his sister, Beth Perry ’81. Elizabeth J Schwarz ’85, April 16, 2016. She was a social worker in Boston for more than 20 years, first at Tufts New England Medical Center and later in private practice. 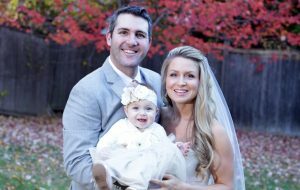 She is survived by her wife, Lisa Perricone, and 2 daughters. Mark C Pfeifler ’86, June 30, 2016. Beta Theta Pi. US Air Force. University of Colorado. After achieving the rank of captain in the Air Force, he became a pilot for American Airlines. He was also an accomplished aerobatic pilot; he was named 1996 Oklahoma Aviator of the Year and also performed in the Oklahoma City air shows 1996–98. He is survived by his companion, Kristy Ray; his dad, Brian ’52, and mom; a brother; and several nieces and nephews. John J Schlachtenhaufen ’87, July 11, 2016. Geneva Study Group. Dartmouth College Tuck School of Business. His career included positions at Anderson Consulting, Cargill, Renessen, and Graphic Packaging International, primarily in development, planning, and execution. He is survived by his wife, Susan ’86; 4 children; brother-in-law Bob Post ’81; and nephew John Post ’18. William G Menges ’91, May 11, 2016. Delta Upsilon, ice hockey, lacrosse. He continued his hockey career after Colgate, playing in the ECHL and AHL. He eventually obtained his MBA and started his own financial service firm, Boston Independent Advisors. He is survived by his wife, Angela, and 2 children. Jeremy Wilk ’00, March 22, 2016. Sigma Chi, Newman Community, golf. University of Rochester: MBA, 2006. He worked in the New York City area in finance for Weschler & Company, GoldenSource, and Alacra, Inc. He is survived by his parents, a brother, and his fiancée, Jessica Miller. Helene G. Combopiano MA’63, December 19, 2015. The tenth woman to graduate from Colgate, she received her master’s in teaching Spanish and then proceeded to teach Spanish in the Binghamton (NY) City Schools for more than 30 years, retiring in 1995. She also taught French and German. She served as president, vice president, secretary, and treasurer for the New York State Association of Foreign Language Teachers (NYSAFLT); director of the Southern Tier NYSAFLT; and president and vice president of Dos Rios, the local Spanish teacher group. For the past 10 years, she was the president of the Eastern Broome Branch of the New York State Retired Teachers Association. She is survived by her husband of 56 years, Anthony; a son; 2 daughters; a daughter-in-law; a son-in-law; 5 grandsons; 2 granddaughters; nieces; a nephew; a sister-in-law; and cousins. Shawkat J Dallal, July 3, 2016. Cornell University Law School: 1959. Joining Colgate’s faculty in 2005, he played a vital role in the establishment of Arabic language instruction. He retired in 2011 as professor of Arabic studies emeritus. Prior, he had a career that spanned many fields and continents, from legal counsel for OAPEC to commissioner of the board of the Palestinian Independent Commission for Human Rights. He was also an adviser to higher education institutions in India and the Dominican Republic before he accepted faculty positions in the United States at Utica College and Syracuse University. He is survived by his wife, Diana; 3 children; 8 grandchildren; and 2 great-grandchildren. Roberta Naim, July 13, 2016. Formerly Roberta Garland, a Colgate professor of Hebrew and Italian 1987–92, she was fluent in Italian, French, Hebrew, Arabic, and Spanish. She was one of the first instructors to teach Hebrew at Colgate. She is survived by her husband, Mark, and 3 children. A successful businessman and chair emeritus of the Board of Trustees, Harrington “Duke” Drake ’41 died at his home in Wickenburg, Ariz., at the age of 96. He was president of the H Donnelly Corporation 1972–75 and chairman and CEO of the Dun & Bradstreet Corporation 1975–85. Financial World magazine named him CEO of the Year in 1984, and Harvard Business School called him “one of the great American business leaders of the 20th century.” Throughout his life, Drake served on the boards of corporations including Dun and Bradstreet, Baxter International, Rockwell International, Irving Trust Bank, and Magnavox. An active alumnus, Drake chaired the Board of Trustees 1978–85, was a founding member of the James B Colgate Society, and received the Maroon Citation (1966) and the Wm Brian Little ’64 Alumni Award for Distinguished Service (1977). 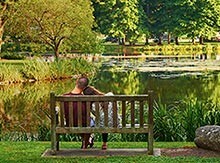 Drake established the Shirley and Harrington Drake Chair in the Humanities, the Shirley and Harrington Drake Endowed Scholarship Fund, and the Patricia and Harrington Drake Scholarship Fund. In 1995, Colgate recognized his service and support of the university by naming a newly constructed residence hall, Drake Hall, in his honor. Drake had majored in philosophy and religion, and was awarded an honorary doctor of laws degree from Colgate in 1985. As a World War II pilot, he helped to transport five-star US generals, Brazilian Chief of Staff Eduardo Dutra, and the Bob Hope Troupe. Drake rose to Lt Colonel in the Air Force Reserve and received the Air Medal and Oak Leaf Cluster in the 20th Troop Carrier Squadron of the 6th Air Force. He is survived by his wife, Patricia; three sons; his stepdaughter, Adriana Beckman ’86; three grandchildren; two great-grandchildren; his brother; and many nieces and nephews. Hamilton centenarian Ruth Hartshorne, the widow of Professor Marion Holmes Hartshorne, has died. She was 103. After graduating from the University of Chicago in 1935, Hartshorne earned her master’s from Columbia University in New York City, where she met her future husband, Marion, with whom she would share nearly 50 years of marriage. The couple married in 1939 and moved to Hamilton, where Marion taught philosophy and religion at Colgate, and Ruth raised their four children. Ruth Hartshorne was a staple of the Hamilton community often seen at the First Baptist Church and the Hamilton Club. She was also a dedicated member of the Fortnightly Club (a women’s research group) and co-founder of both the Chenango Nursery School and the Education Unlimited lecture series. Kerry Houston ’16 is one of these friends. Houston met Hartshorne four years ago when she became a member of Colgate’s Adopt a Grandparent Program. Houston said the pair would often take walks, even in the snow, because Hartshorne loved the outdoors and stressed the importance of staying active. Houston called the sharp-witted Hartshorne “a Colgate expert.” Hartshorne, who had worked at the Colgate library and graded coursework from her husband’s classes, enjoyed having students around to keep her up-to-date with life on the Hill. “Ruth loved learning about the experiences of current students, especially what materials we were studying in our classes and what types of projects we were working on,” Houston said. Hartshorne also relished the time she had to herself. She was an avid reader, enjoyed cooking, kept up with e-mail, and was writing a memoir. 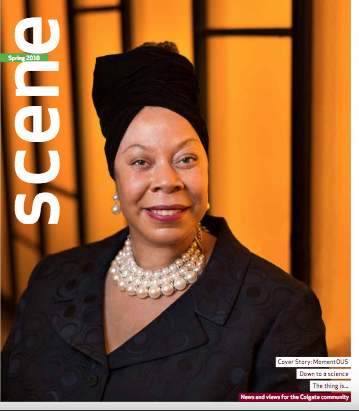 Clever and vibrant until the end, Hartshorne would remark, “I enjoy every minute of life, even when I don’t.” She was profiled in the autumn 2011 Scene article “Aging Our Way,” excerpted from the book of the same name by sociology and women’s studies professor Meika Loe. Hartshorne was predeceased by her husband, Marion, in 1988. She is survived by four children, 10 grandsons, and one great-grandson. 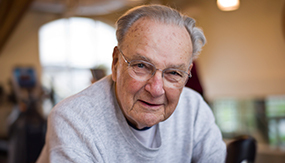 John LeFevre ’41, a man who dedicated more than 35 years of his life to the university, has died at age 97. 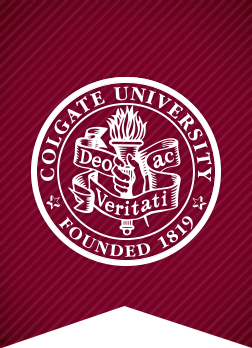 “[He] represented the very best of Colgate,” said dean of admission Gary Ross. As a student, LeFevre was a member of Phi Kappa Psi, pep band, and Colgate’s ice hockey team all four years. His experience with Colgate hockey inspired his presidency of the Silver Puck Club and the university’s creation of the John LeFevre ’41 Appreciation Award given to individuals who make a positive impact on Colgate athletics. After retiring from a 40-year career at IBM, he returned to Hamilton in 1981, beginning his second career: Colgate’s director of alumni recruiting and special assistant to the dean of admission. LeFevre interviewed prospective students, which former co-worker Patty Caprio remembers he enjoyed because it allowed him to share his own experiences as a student. 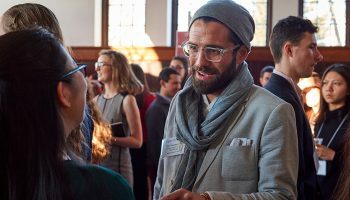 “There are hundreds of students who came to Colgate because of the way he greeted them and talked to them,” said Caprio, senior advancement executive for strategic initiatives. LeFevre retired 13 years later, but continued to volunteer in admission for another 22 years. An extremely active alumnus, he served as president of Colgate’s Alumni Corporation Board of Directors and received both the Maroon Citation and the Alumni Award for Distinguished Service. A member of the Presidents’ Club giving society, he established the John and Marian LeFevre Scholarship. Even into his later years, LeFevre attended alumni council meetings, went to hockey games, exercised in the Trudy Fitness Center, and periodically called classmates to catch up. LeFevre was predeceased by his wife, Marian, and his son. He is survived by a daughter, 8 grandchildren, and 11 great-grandchildren. Physics professor, singer, Hamilton police commissioner, and more, James Lloyd III ’54 was a multifaceted man who shared his talents with both the university and the local community. He first came to Hamilton in 1950 to start his freshman year at Colgate, where he joined WRCU, University Chorus, Masque and Triangle, and Konosioni. After graduating Phi Beta Kappa with highest honors in physics, Lloyd went on to earn his PhD from Cornell University. Colgate recruited him in 1961 to teach in the Department of Physics and Astronomy, where he twice served as chair (1973–77, 1987–1990). During his 35-year tenure, Lloyd also was the long-term adviser to the department’s pre-engineering program, chaired the graduate fellowships committee, and — as the physics instructor to legions of pre-medical students — served on the Health Sciences Advising Committee. Lloyd brought calculus-based instruction into introductory physics and improved laboratory instruction at Colgate. A handy and practical person, he often purchased lab apparatus kits, which he assembled in his spare time. 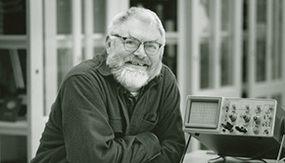 In the 1990s, Lloyd was a key player in the department’s efforts to invigorate the introductory curriculum for physics majors and was co-author of the resulting textbook, Modern Introductory Physics. He retired in 1996. “My hobby is collecting hobbies,” Lloyd was known as saying. His interests included model railroading, radio-controlled model airplanes, and amateur (ham) radio. As an undergraduate, he was on the technical staff of WRCU, and later, he was the station’s faculty adviser and technical director. Later, he took up photography and became known for his color photos of Colgate and the greater Hamilton area. In his darkroom that he designed and built, Lloyd mastered the exacting chemical processes. Talented and resourceful, Lloyd was a deft machinist, a clever electronics designer and troubleshooter, and the first to use liquid helium on the Colgate campus. Using his expertise in radio and cryogenics, he constructed an electron spin resonance spectrometer (an early cousin to medical MRI technology) to study the magnetic properties of amorphous metal alloys at low temperatures. In 1990, his interests shifted to surface physics. With funding from the National Science Foundation, he acquired an ultra high vacuum chamber, equipping it with a home brew electron diffractometer, a thin film evaporator, and a thermal desorption spectrometer. He and his students used this apparatus to deposit ultra pure, atomically flat films of palladium and measure the bonding of carbon monoxide to them (a process critical to the operation of automotive catalytic converters). Beyond Colgate, Lloyd also had a significant impact. He was twice elected trustee of the Village of Hamilton and served as its police commissioner. An accomplished baritone, he was a member of the Blue Parsley Boys, a local group with whom he recorded two CDs. He is survived by his wife, Rachel; two daughters and sons-in-law; and two grandchildren. An expert in the politics of morality, tolerance, and inequality, Joseph Wagner, a professor of political science emeritus, has died. He began teaching history at Colgate in 1974 as a visiting professor before earning tenure in 1980. The next year, Wagner joined the political science department, where he taught courses in the philosophy and psychology of politics until his retirement in 2015. He served as chair of Colgate’s political science department 2002–06 and as director of the international relations program. Committed to the pursuit of justice, Wagner chaired the Affirmative Action Oversight Committee in the 1980s and wrote the university’s first software to track affirmative action hires. He was passionate about the Office of Undergraduate Studies (OUS) Summer Institute, a program for accepted students to ease their transition to college and enhance their academic preparedness. Wagner helped design the program’s framework in the 1980s, taught its courses 1994–2002, and helped form its advisory committee in 2010. Wagner served on a number of committees, including First-Year Seminar, Nominating, Faculty Affairs, Promotion and Tenure, Academic Advising, and Middle States Review. He served as president of the Colgate Chapter of the American Association of University Professors (AAUP) and editor of Vox Facultatis; he was instrumental in establishing the AAUP Professor of the Year Award, which he received in 2003. Wagner’s scholarly articles spanned a variety of subjects, including the media’s impact on elections, the role of moral values on political tolerance, and the relationship between justice and affirmative action. In 2004 he established the Harriette Wagner Memorial Award in honor of his mother. The award is given to the senior art and art history major whose work exemplifies the way visual arts enrich the spirit and express the dignity of human beings. Wagner is survived by his wife, Pat; two children; two grandchildren; and four step-grandchildren.